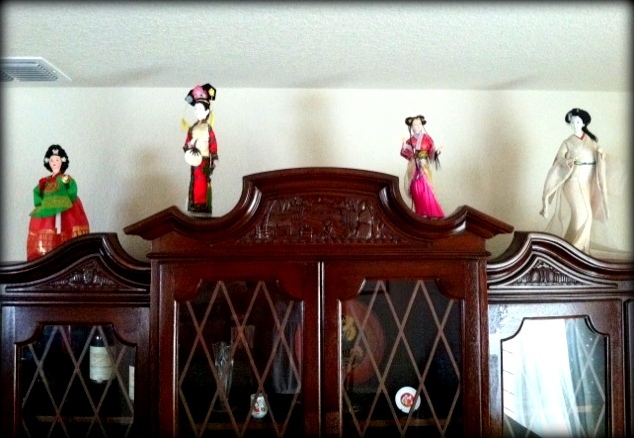 My Asian dolls collection. Hubby got the white Japanese doll when he was stationed (Navy days) in Okinawa. The Pink China doll was purchased on eBay. The red doll was purchased in Hong Kong during our lay over going to the Philippines, and the last one is a Korean doll. I bought it during our side trip to Seoul, South Korea. Right now, I'm still hunting for some Asian dolls. Sorry for the not so good mobile picture quality. Delightful Dolls! And each has a special meaning for you, which is so nice. My parents bought my younger Daughter a Japanese doll similar in style to yours when they went to Japan. cute naman! parang collection na rin nuh? dadami pa yan hehehhe! aw so cute! i think ive seen some at Ross. nyahaha kabalo man diay mupalit ug doll si Goryo, pero pang display lang sa inahan ug dili pwede dulaan ni Akesha hahaha. Nice kaau imong mga dolls, mommy:) Naa gyud kay talent mag interior designer..
beautiful Asian dolls Mommy Dhemz, nahan diay collect nila ani :-) Visiting from Wednesday Whites, hope that you can return the visit too. lovely dolls! i would love to collect those someday, too!